PRESS RELEASE: CELEBRATE THE 2-YEAR ANNIVERSARY OF CUNNINGHAM'S RESIGNATION FROM CONGRESS! A new interactive animated documentary has been released in celebration of the two-year anniversary of Randall "Duke" Cunningham's resignation from office! The new animation is written in Flash from Adobe. The author has nearly 25 years experience as a computer animator, and has created hundreds of animations for professional educational purposes, including courtroom accident reconstructions. This animation is equally accurate and explanatory, and both fun and easy to use. It tells what really happened. The new animation, called simply Celebrity Justice, explains in detail how Cunningham tried to commit suicide by smashing the car he was driving head-on at high speed into the author's car on November 25th, 2005, about 8:35 pm, in San Marcos, California. The police immediately applied "Celebrity Justice" rules to the case and protected the assailant from prosecution. This is the story of what really happened that night, from the point of view of the author and his wife who was a passenger during the incident. Randall Cunningham was presumably despondent over his decision to resign from Congress the following Monday, November 28th, 2005. 1) He tries to flip his car in a solo accident. 2) He aims right at us and accelerates..
3) When I turn to my right, he follows that turn and accelerates. 4) When I turn to my left, he follows that turn too, and continues to accelerate. 5) He continues to accelerate straight at us. 6) He is going so fast he cannot turn away -- unless I do something, a deadly crash in inevitable. To learn what I did at that point, and what the police did after that point, please view the shocking animation! Our future is being stolen. Our health is being destroyed daily by nuclear power and nuclear weapons, and a trillion dollar accident -- something that costs more than both Gulf Wars and will kill more people -- could happen in an instant. In fact, such a catastrophe is INEVITABLE if we don't close the nukes and switch to a green economy. And, no country with nuclear power can afford to threaten with nuclear weapons. We have nullified any long-term strategic advantage such weapons ever offered, by building so many "targets." Each nuclear power plant produces about a ton per week of an incredibly highly-concentrated deadly dust -- a solidified poison gas that can be vaporized in a fire. Burning does not alter the decay rate of uranium or any other radioactive substance. It just releases the poison gas into the environment -- into our lungs. So-called "accidental" releases are INEVITABLE as millions of pounds of spent nuclear fuel are handled throughout the world. Some releases are much worse than others: Chernobyl probably vaporized more than a hundred million Curies of uranium and fission products. Three Mile Island probably vaporized more than ten million Curies. In both cases, monitoring was poorly done. For example, when numbers went off-scale for a few hours, improper reconstructions of the events never recognized that the hours off-scale were probably the most brutal time of all, and the scales were off by orders-of-magnitude. Davis-Besse almost melted down in 2002. The Nuclear Regulatory Commission let the plant, located in a depressed part of Ohio, re-open anyway after nearly two years of rebuilding. The power fluctuations when it was going back online are probably what really caused the August 14th, 2003 blackout -- not some tree touching a power line, as the official story goes! After the fact, the NRC could not say if we were 5 seconds or 5 weeks away from catastrophe, but a football-sized piece of the reactor pressure vessel head had been eaten away by unnoticed corrosion, and the stainless steel liner -- never designed to take pressure without 8 inches of steel on the other side of it -- was all that held back the worst accident in American history -- and the liner -- only 3/16ths of an inch thick -- was already bulging out. Obligingly, the media never told the public how close we came to disaster, but it was very, very close. All nuclear power plants are continuously poisoning the people around them with tritium. Even the lap-dog NRC considers tritium releases excessive if they are greater than approximately one teaspoon per year per plant. (Tritium is hydrogen, but with two neutrons and one proton instead of the usual single proton with no neutrons.) A number of communities have realized that their local nuke plant poisoned their wells with tritium, which has a half-life of 12.3 years, and are suing in court because of illnesses they have suffered. Other communities also suffer, but haven't been able to organize enough to file a lawsuit. Lawsuits are very difficult. They are expensive and time-consuming -- especially while you are caring for a child with leukemia! In addition to tritium and many other radioactive elements that are routinely released, each reactor creates about a ton per week of spent nuclear reactor fuel -- high level nuclear waste. Spent nuclear fuel contains the most vile stuff on earth: Radioactive fission products. There are numerous radioactive decay steps after the original decay of uranium, before it becomes lead or some other stable element, and each radioactive decay step is also dangerous. Some of the fission products of uranium have a special affinity for various organs of the human body, such as the thyroid, bones, liver, stomach, ovaries, or gonads. These fission products appear to be useful atoms to your body, which sees them as STABLE building-blocks of life. In fact they are either radioactive isotopes of useful elements, or they are chemically similar -- and radioactive. The developing fetus is especially vulnerable -- as much as a thousand times as vulnerable as an adult -- so for that reason alone, you can (and should) say that the poison gases released ROUTINELY from nuclear power plants actually TARGET your fetus! The rates of miscarriages, childhood leukemias, and many other diseases all go UP around operating nuclear reactors and DOWN when the reactors are shut down. Reactor operators are baby killers, mass murderers, and terrorists. While it's true that health-care system improvements can, and do, save millions of people's lives, the fact remains that preventing health problems in the first place is the real key. The primary goal is to preserve the quality of life for as many people as possible, for as long as possible. Spent nuclear fuel -- solidified poison gas -- and especially the fission products -- must be carefully kept away from humans. In addition to tritium, radioactive cesium-137, strontium-90, and iodine-131 are routinely emitted by nuclear power plants, to mention just a few of over 200 different isotopes which are created during the "splitting of the atom" in a nuclear weapon (in a fraction of a millisecond) or a nuclear power plant (more slowly). Spent nuclear fuel -- a witches' brew of radioactive elements -- can self-ignite if exposed to air, or if it is simply packed too tightly together, since it generates enormous amounts of wasted HEAT for hundreds of thousands of years. Besides gaseous releases from fire, a "criticality event" is also possible in some cases, if spent reactor fuel is improperly handled. Nearly a ton per week from each of more than 440 nuclear power reactors around the world (plus military propulsion units) is over 50 tons per day of NEW high level radioactive poison gas (temporarily solidified). That's the legacy we are leaving our children. An absolutely unmanageable mess, growing at an utterly alarming rate. THAT is what we base OUR CHILDREN'S future hopes on -- NOT on their ability to produce clean energy for themselves -- those solutions exist and just have to be implemented -- but on our children's ability to DISCOVER an as-yet-unknown way to keep OUR poison gas -- the nuclear waste WE generated for OUR pleasure -- from poisoning themselves and THEIR CHILDREN! And in order to work, this "solution" MUST violate the laws of physics! For 60 years scientists have looked for the "holy grail" of nuclear waste storage -- a container that won't break down -- but it's hard to find good scientists willing to devote their life to the search, because good scientists know it's futile. When a radioactive element breaks down -- emits radiation -- it has enough power to destroy hundreds or even thousands of chemical bonds in things around it. Thus, all containers you try to put radioactive substances into are inevitably destroyed by the radiation. The ability of clean renewable energy to completely replace all our current energy sources is only disputed by spokespeople for the energy sources that poison our environment and cause leukemia, cancer, heart disease, genetic damage, and other insults. Dirty energy sources that make money by robbing your children of their health, and doing so in your name -- because you allow it. The poison gas that is created is odorless, colorless, and tasteless, and can take decades to express itself in your body (cause cancer, for example). AND corporations can make a lot of money if they ignore the risks or downplay the dangers to the public. Humanity must get realistic about this, or it will continue to suffer and die at ever-increasing rates -- more frequent cancers, and cancers occurring in younger people. The whole idea of green energy accepts that energy is vital to society, and it should therefore be produced in the most benign ways possible. Conservation can only get you so far -- after that, your source of energy MUST be clean. So stopping nukes is the most important goal of all energy users on this planet as well as of all realistic environmentalists -- or should be. If you think Al Gore will help clean up the environment, think again. Al Gore thinks nukes can be part of the solution to global warming -- but he says he believes they can play "only a small role." Because he's subtle about his support for nuclear power, many would-be environmental activists are sucked in by his ruse, believing that we can let nuclear power continue to be a part of the mix -- as long as its portion doesn't go up. The truth is: That's not nearly good enough. And a meltdown is the ultimate inconvenient truth. Such appeasement of the current nuclear juggernaut of environmentally-damaging power reactors kills the whole green revolution before it takes its first step, because unless we shut the plants down (and maybe even afterwards, but it's far less likely), there WILL be an accident -- a meltdown. It's as inevitable as 100-year floods, 500-year earthquakes, thousand-year storms, and thousand-century volcanoes (and a meltdown could be caused by any of these). The results could be a thousand to a million times WORSE than the triggering event. Nuclear power is not green, it is anything but. The building of, and eventual decommissioning of, the reactor itself uses massive amounts of fossil fuels, as does supportive mining, milling, enrichment, reprocessing and waste storage. But CO2 isn�t �my� main concern. What could be more important, is releasing into the environment Uranium, as well as hundreds of �products of fission� that are produced in a reactor (or a bomb). Eg - Cesium 137, Iodine 131, Strontium 90, Tritium and Plutonium 239. Other toxins dangerous to our health are the products of radio-active decay (or RADs) from mine tailings and various production facilities, like thorium, radon and polonium. The nuclear industry is lying about the dangers of exposure especially when these isotopes lodge inside your body. Some so-called experts have wrongly asserted that external dose is the same as an internal dose. These experts calculate the radiation dosage over the �entire body� of an adult male, not considering differences for infants, children or women. First, you need to know that these toxic particles each have specific dangers. Cesium 137 mimics potassium and concentrates in muscle tissue, like the heart, Iodine 131 concentrates in the thyroid, Strontium 90 mimics calcium and bio-concentrates in milk and is found in teeth and bones. Plutonium 239, named after the Greek God of Hell, travels around the body in the blood mimicking iron and incorporates in hemoglobin destroying red blood cells. The fetus, infants and children are most severely affected due to their fast growth (rapid cell division) and size compared to contamination levels. The diseases associated with radio-active contaminates are common and widespread. This is principally because fallout from nuclear bomb testing and Chernobyl travelled around the planet; only falling to the Earth in rain or snow. Nuclear reactors, spent fuel reprocessing facilities and depleted uranium (DU) weapons have further added to the burden. Have you ever asked yourself why have we become such a sick population? One reason carries a large portion of the responsibility and that is the contamination of the environment with man-made, or man-released, radio-active material - starting with the Manhattan Project. These �hot particles� nucleate and oxidize proteins and fats, they destroy or mutate DNA, they internally ZAP cells with millions of electron volts of energy killing those closest and altering others (called the by-stander effect). Once released into the environment, they contaminate the air we breathe, the water we drink, and the food we eat. 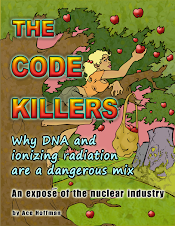 The nuclear industry�s big secret is a 5-60 year latency period before the on-set of disease. Don�t believe their spin doctors who manipulate data to hide the truth. In contrast, after nine years of post-Chernobyl study, Professor Yuri Bandazhevsky of the Gomel Medical Institute, Belarus discovered an associated increase in all the following conditions which he calls �Long Term Incorporated Radionuclide Syndrome�: heart disease (Cesium-cardiomyopathy), kidney disease, spontaneous abortions, infant mortality, genetic defects, congenital malformations, cancer, psychiatric diseases, impaired mental development, alterations in the immune system and hormonal balance, slow growth in children, abnormal exhaustion, delayed convalescence and premature aging. After publishing his findings, he was falsely accused of bribery and thrown in jail (2001 2005). If not for the efforts of Amnesty International, he�d probably still be in jail. Please educate yourselves. Start by reading Dr. Helen Caldicott�s book �Nuclear Power is Not the Answer�. You can watch her March 6, 2007 lecture at the University of Regina on google video. To learn about the health consequences in Belarus and Ukraine following the Chernobyl melt-down watch �Chernobyl Heart� on google video (listed as a 4 part series). P.S. - I can supply several DVD documentaries on these subjects to anybody who is interested. One day while walking down the street, you could be surrounded and taken away by undercover police. Not one of them will remove his sunglasses or show you a badge. You will be put in a dark, dank cell with people who have committed murders, assaults, terrorist acts, and other violent crimes. Some of them will be nice to you and win your trust (only to betray it later, for a better offer). Others will abuse you and destroy your hope. Waterboarding was first standardized during the Inquisition. It was good enough for the Christian zealots of the Inquisition, but it should NOT be good enough for us. It was also used by the Khmer Rouge, the Gestapo, and the French in Algiers, according to a guest on Keith Olbermann (MS-NBC), an admiral, a former JAG. He adds that it is "a tool of the lazy, the stupid, and the pseudo-tough." Waterboarding is torture because, if it's done effectively, the victims are terrified of death and, indeed, sometimes die. Their minds are damaged because, from that instant on, they know that someone else controls their life. They are victims of fear, hatred, and paranoia. If they seek justice later through the courts, 99 times out of 100 that too will fail. Waterboarding is easily denied. Both the tortured and the torturer are more likely to later become vigilante torturers, themselves. Spouse abusers, suicidal, demented, deranged, deluded -- anything but defused. Waterboarding is torture because you know you wouldn't want it done to you, if they got the wrong person. What the Bush Administration REALLY wants is for some form of torture to be made LEGAL soon. If waterboarding is judged by the public to be too extreme, SOME torture will be deemed NOT too extreme, if they have their way -- for foreign "illegal combatants" only, of course. At first. These are NOT the principles America was founded on -- not at all. At every step America has denounced the very idea of torturing prisoners. Bush says: "America does not torture." I wish this statement was true, but it cannot be made true by trying to change (or fine-tune) the definition of torture. NOT allowing torture gives us moral justification to take as many prisoners as necessary. Not allowing torture makes it much easier for combatants to lay down their arms against us and BECOME prisoners voluntarily -- knowing they really, truly WON'T be tortured. This saves American lives. So the question is not whether waterboarding is torture, the question is whether we can recognize torture when we see it, as opposed to "mere" (we're supposed to believe) "rough interrogation techniques." Bush is betting we can't, or don't care -- as long as it's not used on us. Some forms of torture already are legal in America: For example, getting pepper-sprayed at an enviro rally, or tasered at a political rally. This is NOT the America I grew up pledging allegiance to. This America is rotting from the top down. The scars run deep across the planet because of the Bush Administration's criminal behavior. That they want to leave the next administration with the same level of control, protection from observation, and immunity from prosecution is their most terrifying agenda of all.